I hope you’ve all been having an excellent festive season, whatever you’ve been up to! 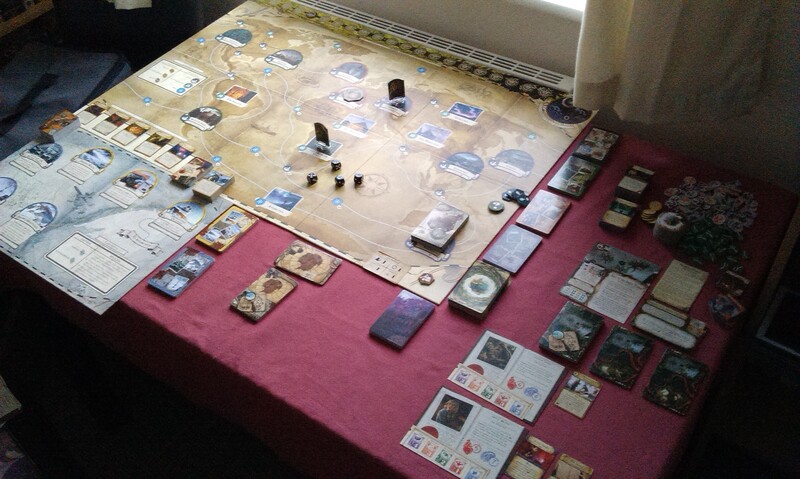 I had two very exciting games, one of which I managed to get in a game with at the weekend – the Mountains of Madness expansion for Eldritch Horror, which I’d like to talk about today, as I share my experiences and first impressions. Basically, I love this expansion! Two new Ancient Ones, complete with associated decks of mysteries, research encounters and special encounters; eight new investigators, and a new side board with associated encounter cards. 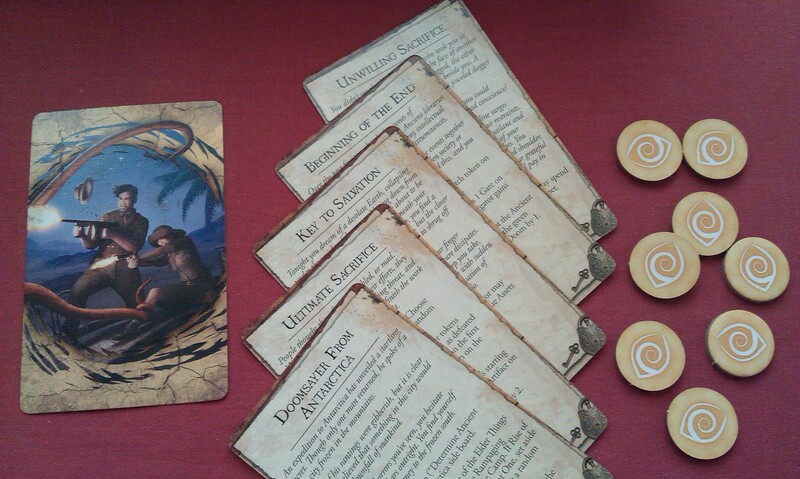 Along with a whole load of new encounter cards for the base game, and assets and spells and conditions and artifacts. You also get enough new Mythos cards to make up decks for each new Ancient One. Fabulous! The addition of the new board felt a lot like the new town expansions in Arkham Horror, though after a short while the similarity largely disappeared. For one thing, it’s much easier to travel between the boards. 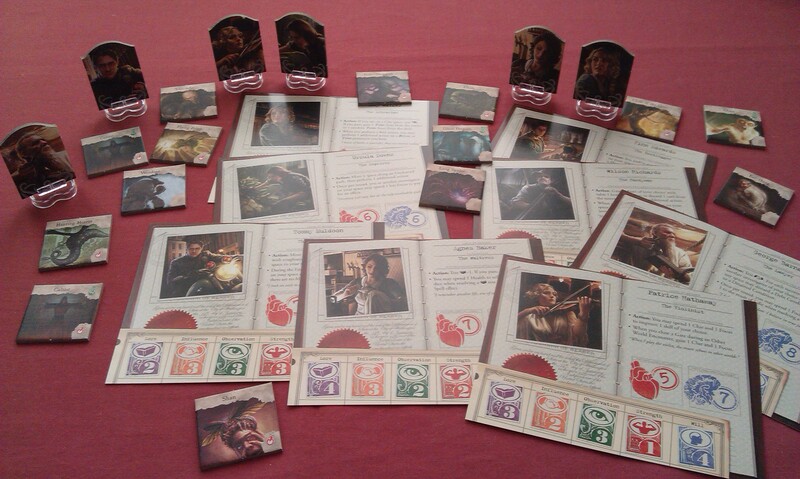 There are rules to govern the use of the expansion components, largely through the introduction of the Prelude cards. But let’s get back to the goodies inside this box! 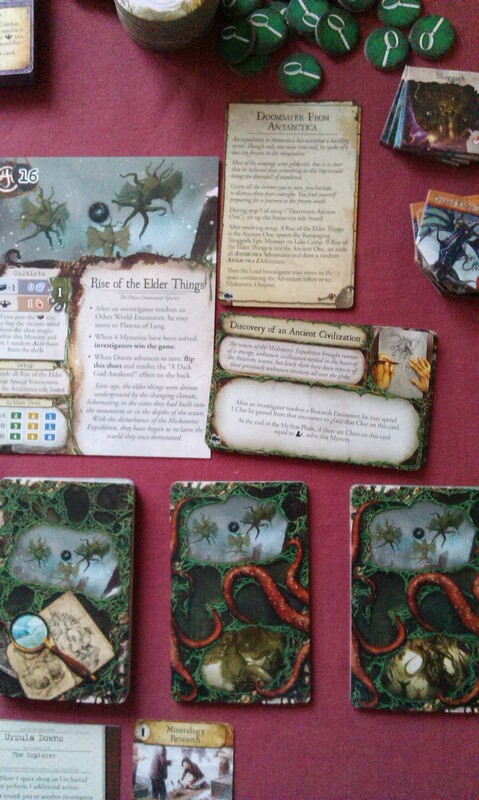 Rise of the Elder Things is a fairly intense game, needing four mysteries solved to defeat. They also come out of the box with two special encounter decks, one of which is used if they awaken. 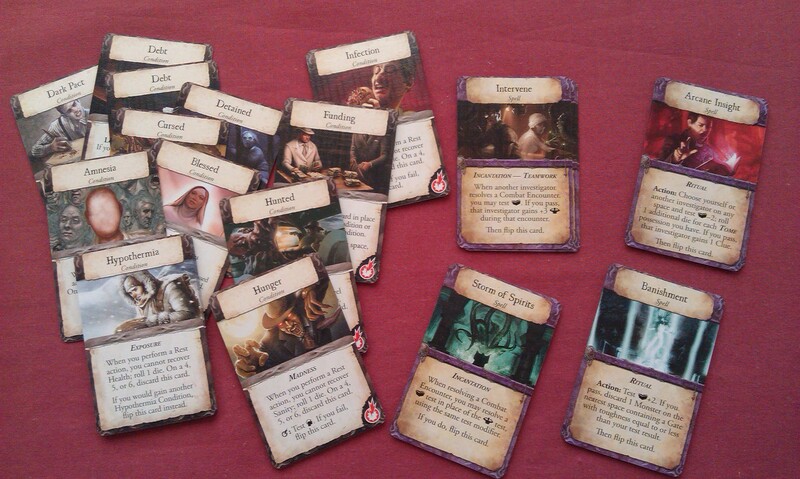 The new Investigators are drawn from the Arkham stable, with most from Innsmouth Horror. 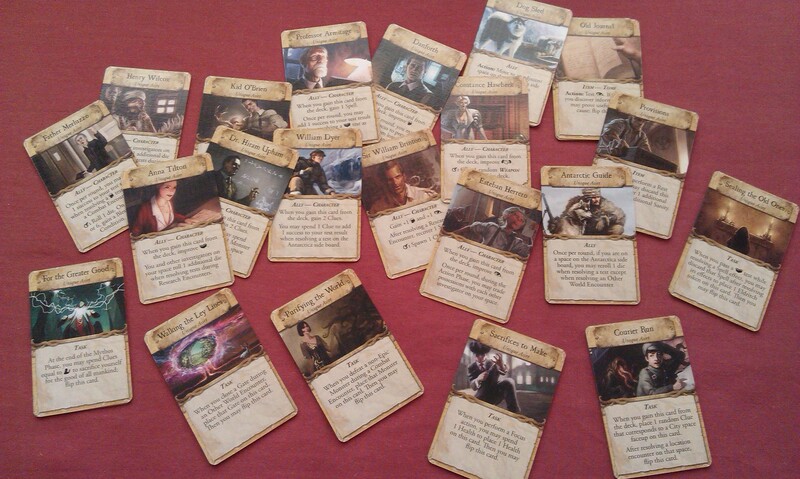 A lot of them have abilities that work on the new Focus effect – as an action, an investigator can collect a yellow Focus token (shown earlier), which he can later use to re-roll one die; each investigator can only have a maximum of two focus tokens, however. A useful action, as previously investigators could only re-roll dice if they had specific assets, which usually only allow for re-rolls on specific tests. 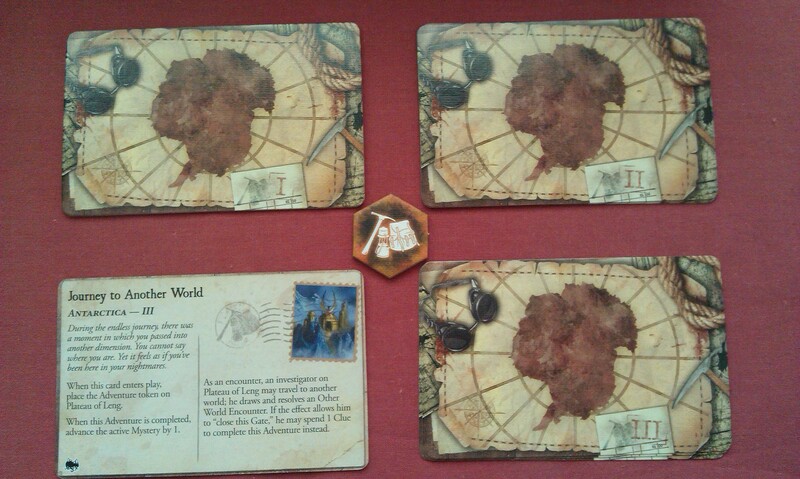 There are quite a few more interesting twists on the original mechanics, such as encountering clues on Antarctica, where you use a special encounter deck rather than the Ancient One’s research encounters. That was a nice little twist, though necessary given that none of the spaces on the new board is marked as a city/wilderness/sea. 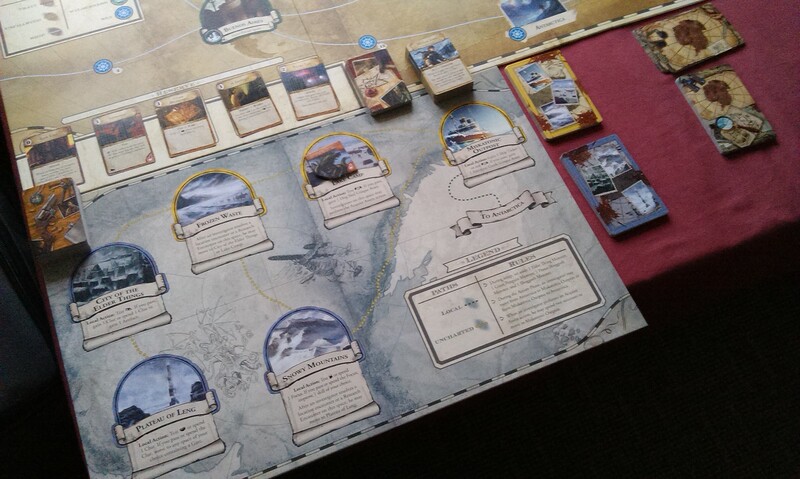 There’s also an Antarctica Adventure deck, which I’ve not yet used, but appears to work from using the side board without the Rise of the Elder Things. Will have to try that at some point. Unique Assets are an interesting idea as well, with many being the reward for new encounters around the board. Mainly Allies, these assets also introduce Tasks, which give you rewards on whether you complete them, which are virtually the same as Tasks/Missions that were introduced in Dunwich Horror. 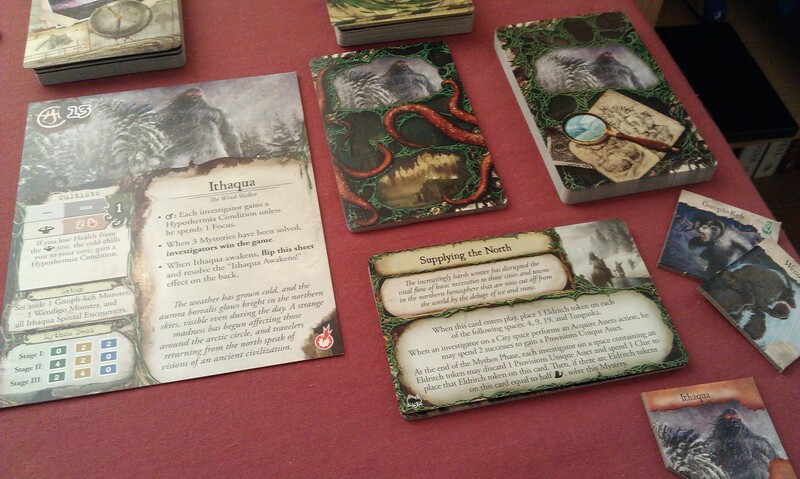 Indeed, Mountains of Madness continues the trend of taking elements of Arkham Horror and refining them in this way. However, while comparisons with the older game are perhaps inevitable, they are also unfair, as both games are perfectly enjoyable and awesome, without having to force a preference between them. We also get four new spells, and new Conditions – including Hypothermia, which is a bit like the main Poisoned Condition in Forsaken Lore for providing the expansion theme. August Derleth’s giant wendigo, Ithaqua is another of the Ancient Ones from the base game of Arkham Horror, I think he’s the second-easiest to fight against, by common convention. 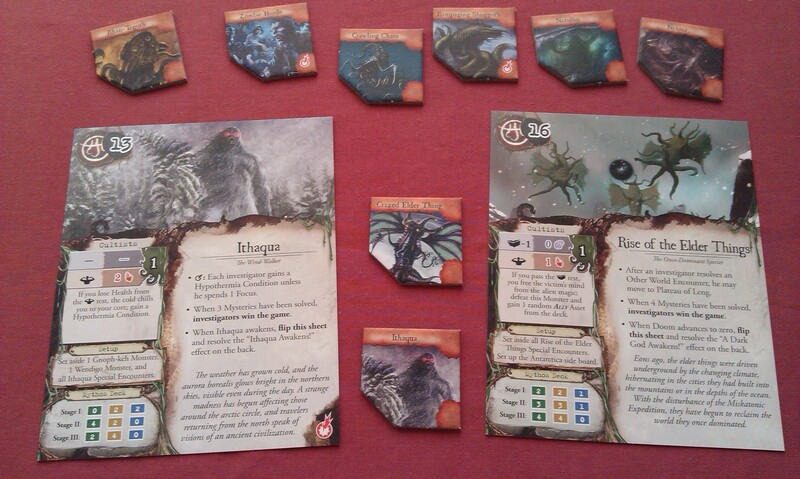 I have to admit, while Yig is definitely more deadly in his Eldritch Horror incarnation, Ithaqua is fairly tame, I felt – though of course, this could just have been down to the start aligning in my favour, as I did have some pretty good draws in my game against him at the weekend. With his appearance in the game, only two more Ancient Ones are left from the base game of Arkham – Nyarlathotep and Hastur. While Mountains of Madness hasn’t even been out for a fortnight yet, like any rabid boardgamer, I’ve already found myself thinking what’s next for the game. If the model for one new Ancient One in a small box holds true for expansions, there’s a case to be made that either Nyarlathotep or Hastur could provide enough material for this – the former with his Masks and Mi-Go, the latter with the King in Yellow shenanigans. They could also throw an entirely new direction and give us Shudde M’ell and the Cthonians, or Glaaki, or any other of the Ancient Ones that have appeared in the mythos over the years. And what of side-boards? Have we got more in store? If so, will they always work off an expedition space? It was remarked upon back when the game was first announced how Africa doesn’t have any named spaces, but two expedition spaces – will we be traversing the Heart of Africa? Nyarlathotep will almost certainly be in a Pyramids expansion, with the Dark Pharaoh as his Herald. Ah yes, what of heralds and guardians? 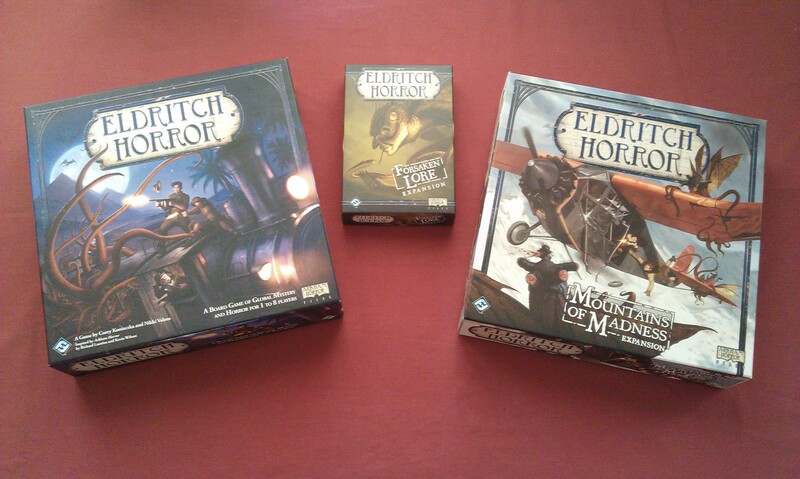 Wonder if they’ll do an Eldritch Horror equivalent. Forsaken Lore was announced about two months after Eldritch Horror was released, but that may not be repeated this time due to the nature of the beast. However, I’m fairly sure the next expansion will be a small box, and will most likely follow the Yig example. However, the next big box is something of a mystery. I’m not exactly desperate for another side-board expansion, and indeed, the way FFG refer to Mountains of Madness as “a side-board expansion for Eldritch Horror” has me wondering if there will be another type of expansion. We could perhaps have a big box that introduces heralds and guardians – maybe even institutions? 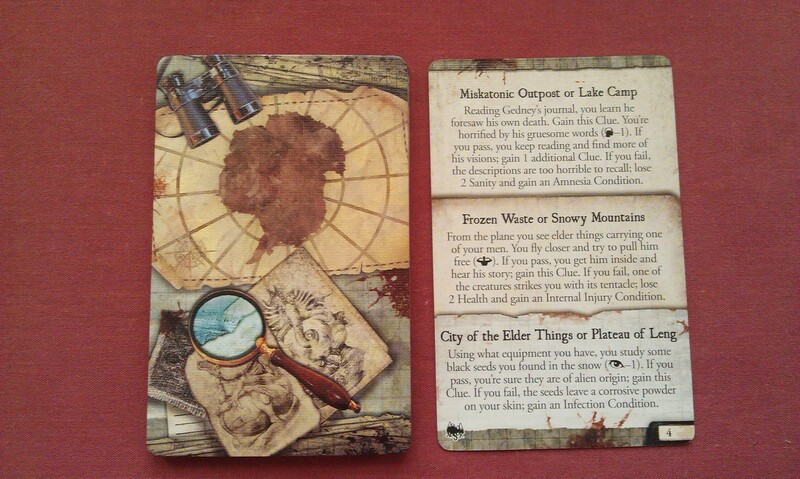 – and provides more cards for the Ancient Ones and the locations, a sort of Miskatonic Horror with a twist. Whatever follows Mountains of Madness, I’m looking forward to it with abandon – and I’m sure it’ll be awesome! 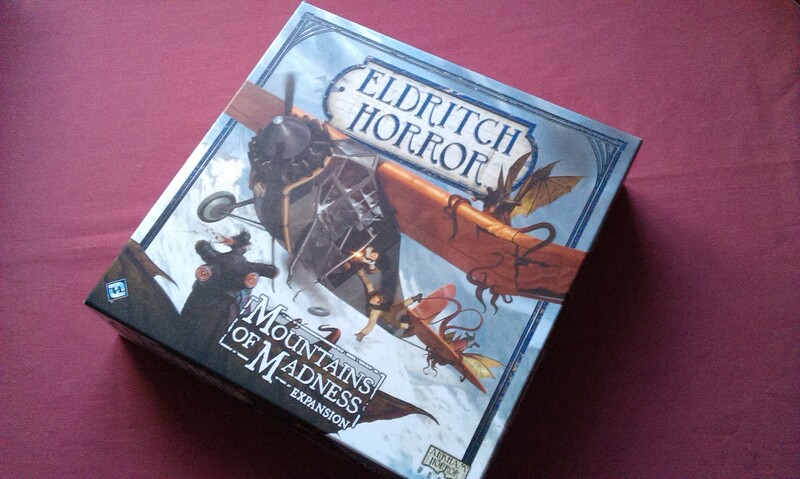 Author spalanzPosted on December 30, 2014 October 6, 2015 Categories board gamesTags board games, Eldritch Horror, Fantasy Flight Games, game day, Lovecraft, Mountains of Madness4 Comments on Horror in the Mountains!